Drawn to Dinosaurs delves into the science and art of visualizing a living animal based on fragmentary fossils. 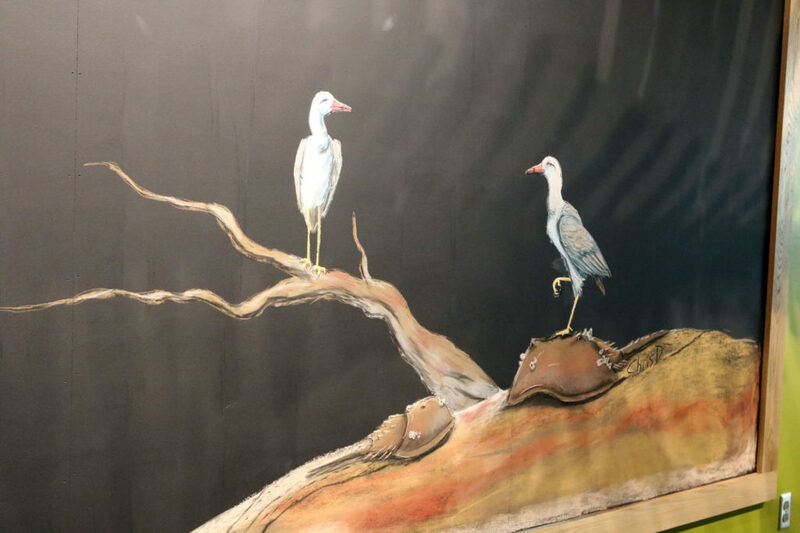 This intimate exhibit illustrates what scientists can deduce from the fossil record when creating a reconstruction of a skeleton or model and what they must look to artists to interpret. The centerpiece is a full cast of the plant-eating dinosaur Hadrosaurus foulkii, discovered in 1858 in Haddonfield, NJ. The Academy created a full cast of this duck-billed dinosaur and put it on display in 1868, becoming the first place in the world where the public could go to see a dinosaur. 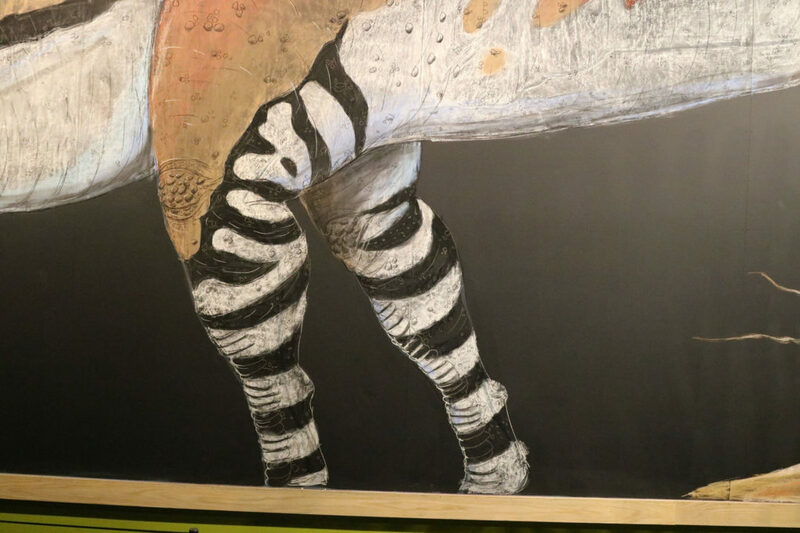 Each year, a new depiction of Hadrosaurus foulkii is added to the giant chalkboard behind the full cast of the animal. 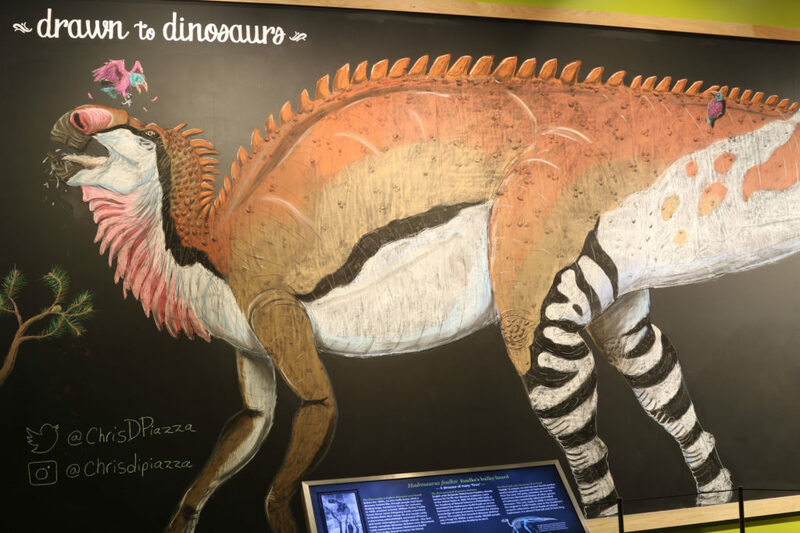 In 2019, artist Christopher DiPiazza brought Hadrosaurus to life with a brightly colored chalk illustration that shows a new take on what the dinosaur may have looked like in life. “I wanted to incorporate the newest discoveries that we’ve found about this group of dinosaurs,” DiPiazza said. “I also wanted to do a color scheme that was believable and realistic, but also different from things that we have seen from this museum before for this dinosaur. Here more from DiPiazza about drawing Haddy. See more time lapse videos of previous artists drawing Hadrosaurus. Previous Post:Are Dire Wolves Real?